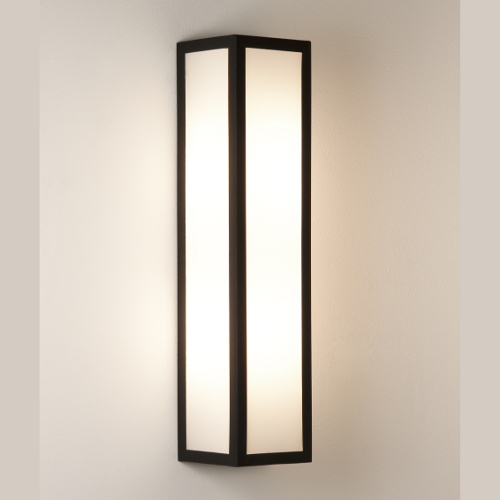 An elongated rectangular shape characterizes the Salerno Wall Light by Astro Lighting. As the Italian city of Salerno, which it owes its name, the wall lamp spreads a antique, Mediterranean flair. A black frame completes the opaque, light diffuser on all sides. The closed lamp casts warm and inviting looking light in the round and you can almost feel yourself in the holiday mood, if one stays close to the lamp. The Salerno wall lamp is a spill-resistant outdoor light for their use a terminal compartment in the wall must be present.